I have said often that I don't like the idea of investing directly in China. This morning I ran across a series of four write-ups on Kandi Technologies, Corp. (KNDI) that has me reevaluating not only my not-to-invest in China policy but my view of the future of electric vehicles as well. This is really exciting! Can electric vehicles (EVs) be disruptive technology? Not the way the major auto makers are approaching the market. To be disruptive a technology has to be cheaper and the Volt sure isn't, and it has to serve an under-served market and the Volt sure doesn't. To have a chance of success, EVs need a really new paradigm. It seems that Kandi Technologies has found such a new way. 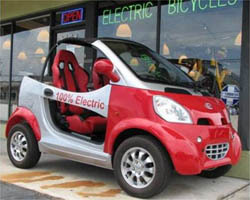 Kandi was founded in 2002 to manufacture and export "two, three and four wheeled gas powered, mainly off road, recreational vehicles exclusively for the US export market." When that market collapsed in 2008 the company changed gears into EVs with a radically new approach to vehicle ownership. One eye opening statistic is that in China 50 million people join the ranks of the middle class each year. That's more than the whole population of Venezuela! If just 1% want to own cars, that's 500,000 cars per year! The market is HUGE! But they can't afford Volts. They need a small affordable vehicle. 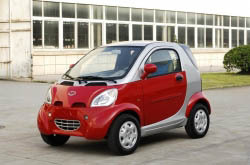 But "small" or rather light weight, is just what you need to make electric cars functional. Half the cost of the car is in the battery and Kandi is going to sell the cars without a battery! How's that for New Paradigm thinking? They are making their EV with a quick changing battery (it takes about 2 minutes to change it) and the batteries will be owned by a cartel of battery service stations. This solves an innumerable set of problems starting with the capital outlay for the battery, a place to plug it in overnight and the resale value of the vehicle which will no longer be influenced by the state of the battery since it does not come with one. Pretty damn ingenious. And the Chinese government is supplying huge amounts of subsidies. Under these conditions, EVs could well become a disruptive technology, cheaper, less capable and serving a brand new market. It should not come as a surprise that these ideas were not hatched by a major automaker. Majors don't want to cannibalize their own markets, they want to continue serving their very best customers who don't want dinky little toys for cars.